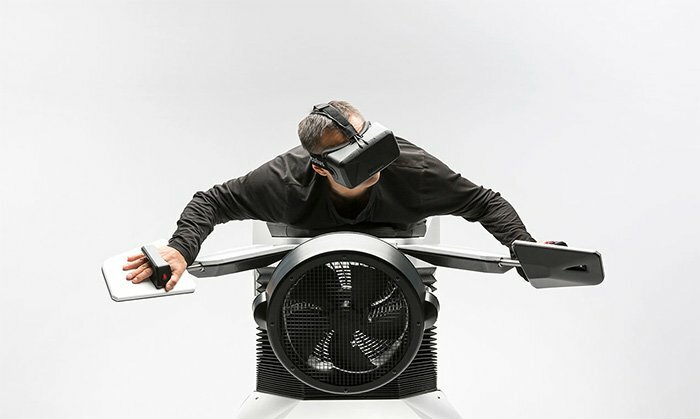 Birdly is a first-of-its-kind flying simulator where operators command their full-body VR flight experience instinctively with arms and hands. The longing to fly is almost as old as the human race. It’s illustrated in many failed attempts to mimic birds and other flying creatures. Somewhere along the line, we came to terms with the fact that a flying human may not be more than a dream and we turned to the aviation industry instead. Still, many investors are daring to push the boundaries and there have been numerous bold attempts to defy human bio mechanics. Such inquests led to the development of Birdly; a product of virtual reality, robotics, and simulation technology. This innovation delivers the ultimate flying experience, without actually flying, of course. Birdly is nothing like your regular flight simulator; it doesn’t use a joystick or other buttons that’ll take an age to master. Rather, Birdly delivers the ultimate flight experience through coordinated hand movement. The hand movement shares a close semblance with the flapping of wings and manipulation of feathers in birds. The Birdly comes as a USB device that is simulated on a Unity Engine. The game employs interactive storytelling, giving users intimate and detailed views of cities, forests, landscapes, and virtually any other feature. According to the manufacturers, D3D Cinema is responsible for producing customized content for Birdly. Birdly comes with a fan that speeds up as you go faster. There is also an olfactory module that mimics the smell of the region you’re flying over. These features serve to create a multi-sensory experience that stretches the limits of Virtual Reality. The Birdly user lies face down on the custom Birdly table. The table supports the arms, chest, hips, and legs. Admittedly, the table may be slightly uncomfortable but the experience is more than worth the very slight discomfort. The head accommodates the rift and the arms are spread across the board, allowing them to act as wings. As a player, you might be concerned about onlookers’ perception of you while operating the Birdly. But once you start flapping away and soaking in the unbeatable VR experience, your concern would easily melt away. Controlling Birdly is easy as pie even for someone without any flight experience. Flapping the arms increases the speed, rotating the wrists increases elevation, and lowering or raising the arm directs the flight to the desired direction. All these movements are intuitive and you should have no problem getting a hang of them once you mount Birdly. You can visit the official Birdly website to place your order. You would find useful information about the requirements and components that come with your order. Your device should arrive after 10 weeks of placing the order according to the manufacturers. The list price for Birdly is $135,000. Other charges and fees may apply.